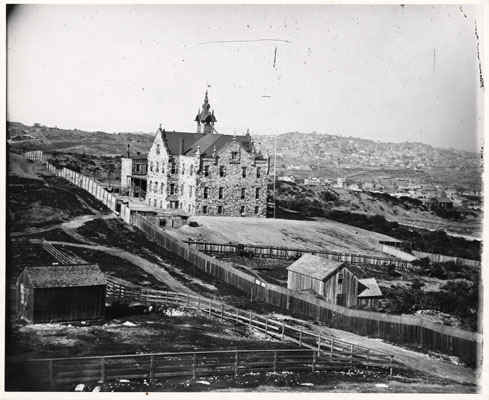 The San Francisco Orphan Asylum Society (SFOA) was founded in 1851 by a group of ladies attending meetings hosted by the Reverend Albert Williams and his wife. The asylum was originally founded to help a group of siblings, aged 3 to 12 years, orphaned by cholera en route to San Francisco. In the early days, the SFOA Board of Managers was comprised of all women. For legal reasons, the Board of Managers appointed three gentlemen to hold property in trust for the SFOA. The first matron of the SFOA was Mrs. Wilson. The first on-call physician was Dr. Benjamin Coit. The orphanage opened on March 19, 1851 in a prefabricated cottage in Happy Valley, now known as the South of Market area surrounding Rincon Hill. The population of the orphanage grew as the Managers placed local children in need of aid. Most of the San Francisco children were not orphans, but from single parent homes. By 1852, there were 26 children in the orphanage and a new, larger home was needed. The Board of Managers purchased land available through public auction. The property was considered remote and far beyond the city limits. Throughout San Francisco, the Board Managers solicited door-to-door donations to raise money to purchase the property and partially fund construction costs. For a purchase price of $100, a two block lot bounded by Haight, Buchanan, Hermann and Laguna Streets became the new site for the San Francisco Protestant Orphan Asylum. The site would remain home for the orphanage from 1854 to 1919. San Francisco legend has it that Haight and Waller Streets were named after Mrs. Haight and Mrs. Waller, who served on the SFOA Board. The children moved into the new facility on March 22, 1854. The original building was a two-story dormitory-style structure. It was built of stone which was quarried from the site of the old San Francisco Mint. Spring Valley Water Company transported the stone free of charge. The children were schooled on site in the years from 1854 to 1897. After the home on Haight Street was built, the Managers raised money for the orphanage through annual “subscription” donations from local Protestant churches. Many prominent San Franciscans donated to the orphanage: H. H. Bancroft, Lillie H. Coit, Mrs. Crocker, James Flood, James Phelan, Mrs. Stanford, Levi Strauss, and Adolph Sutro. Throughout the years, local merchants and philanthropists sponsored outings for the orphans, including the Mid-Winter Fair of 1893, and the Pan-Pacific International Exposition of 1915. The number of children housed at the orphanage grew from two dozen to three hundred. From all accounts, Hayes Valley residents enjoyed having the children living in their neighborhood. The orphans socialized with the neighborhood children and it was not uncommon for them to play in the orphanage garden. On April 17, 1906, the San Francisco earthquake and fire destroyed much of the City. Everyone escaped from the orphanage unharmed. Because the building was located west of Van Ness, it was damaged, not destroyed. Orphanage after 1906 earthquake damage. The repairs were complete by November, 1906. 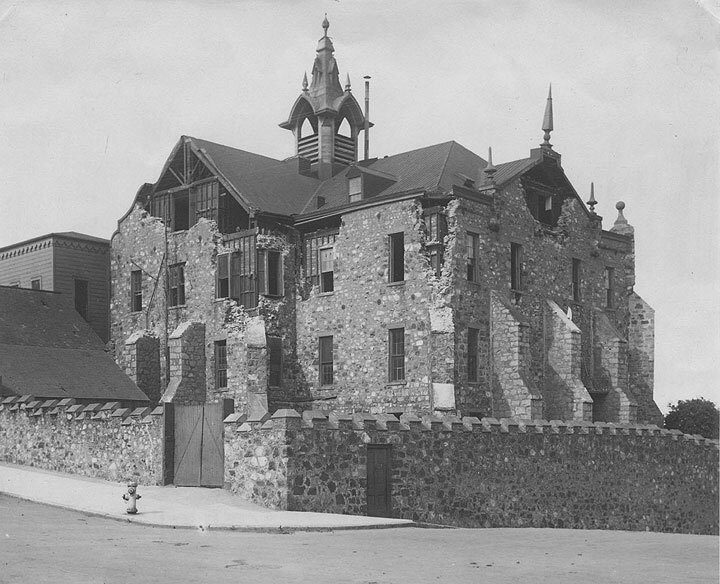 For a period of time, the displaced children resided at the State Normal School, (which would later become San Francisco State University) on the southern half of the property. The orphanage had leased this portion to the State of California. In 1919, because of the earthquake damage and age of the building, the Managers decided to sell the property and construct a new orphanage in another part of the City. The State of California purchased the property. The orphanage was razed. 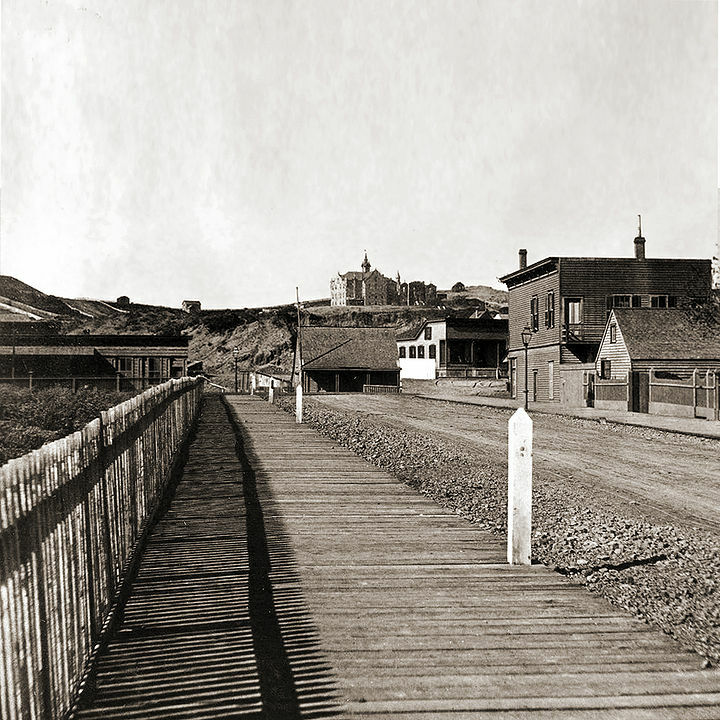 This photo with the picket fence was taken about 1865 on Waller Street between Octavia and Laguna Streets looking west up the hill towards the corner of Laguna, which is crossing from side to side at the base of the hill. During that time, there were a few businesses on Laguna Street, as it was a suburb of San Francisco and considered the outskirts of the city. During the 1860s and 70s, there was a creek that ran from the top of that hill down the middle of the property bordered by Laguna, Hermann, Buchanan and Haight Streets, coming down to the corner of Laguna and Market, crossing Market and down modern-day Guerrero Street and then down the hill roughly where Duboce Street runs, running past Woodward's Gardens and under the site of the Armory (built in 1912) into the wetlands that once filled the north Mission. Those tidal wetlands were filled in around the 1880s. The Hotel Valencia was built on top of that "made land" and was heavily damaged in the 1906 quake, with many lives lost because of liquefaction. Back to the hill at Laguna and Waller, it was largely filled in and smoothed over in the 1870s and became a big sloping hill with wild grass, instead of a rocky and dangerous crevice. Waller Street between Laguna and Buchanan was blocked and until 1906 the orphans and neighborhood children played on and around that gentle hill. 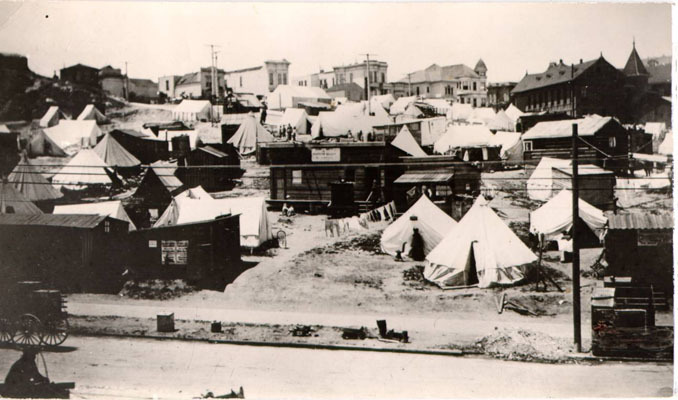 When the earthquake struck and the fires started, the two fields, as well as the triangular property at Hermann and Laguna (now the site of the Orbit Cafe) filled with refugees from the fire. The fire stopped short of Market Street and for many months refugees camped in tents on that hill in those three empty blocks. The Orphans' home was repaired in 1906 and continued to be used, but age and old earthquake damage eventually took its toll and it was finally torn down in 1919. If you look at the 1860s photo, you will notice a picket fence. Today that fence line is where the apartment building at 50 Laguna sits. A photo taken today would show the garage doors on the ground floor along that fence line. Across the street (just below the Asylum) today is the gate to the parking lot of the U.C. Extension. Waller Street was opened up again and extended up the hill in the teens and twenties. A couple of magnificent art deco apartment buildings were erected at that same time on the Laguna/Hermann triangle. 16 Laguna was built in 1935, which matches 50 Laguna next door in the art deco "moderne" style. During the 1930s, the University of California Extension was built on the property and Waller Street going up the hill disappeared once again as a through street and was reduced to become part of a parking lot. After 1906 earthquake and fire, a refugee camp was established on the slopes of what was then known as "Clinton Mound," today's Mint Hill. 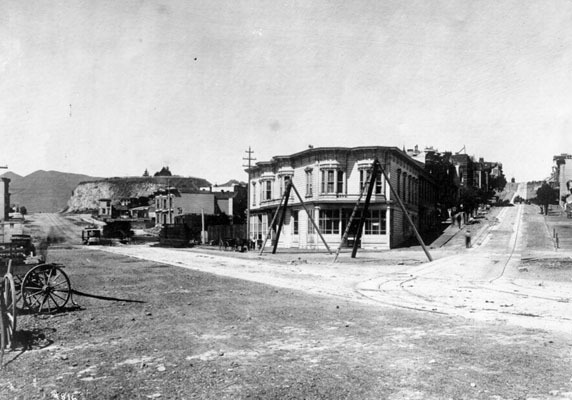 Haight and Market, 1889, note Clinton Mound at edge of Market Street uphill to the west.